David P. noted that "Hah, awesome, you can get Fillet of Reindeer in the Snowresteraunt"
The SnowCastle of Kemi by the Gulf of Bothnia is the source of great pride as well as a true showcase of architectonic snow-work of the local constructors. 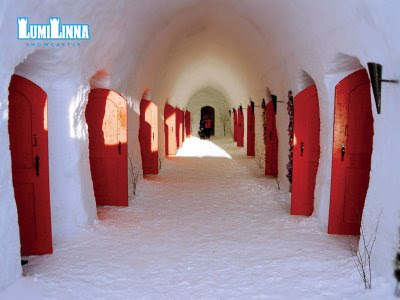 Every winter the SnowCastle offers wonderful experiences for both children and adults alike. Great light-effects will add to the charm of the snow- and ice-sculpting as well as to the structures about the SnowCastle. 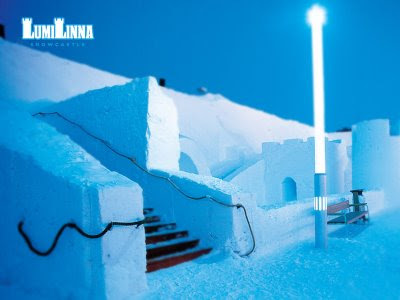 The constructions of the SnowCastle 2009 at the Inner Port of Kemi began on December 31st. Opening ceremonies was held on Friday the 30th of January 2009. SnowCastle will be open daily from 10 am – 7 pm. The Castle will be closed on the 12th of April, weather permitting. Welcome! Nah Dave, this one in Sweden is even better.